Did you see all the winner's from the past giveaways? Click here to see if you won! 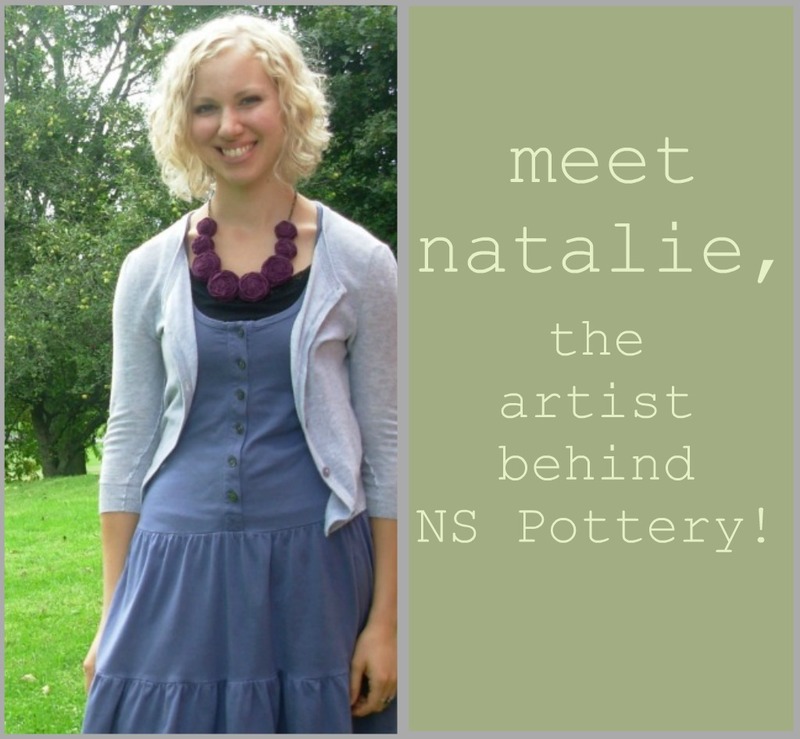 This week, I get to share with you the lovely shop, NS Pottery. Natalie is the darling gal behind this shop and I'm always impressed to see what kind of new products she puts in her shop! 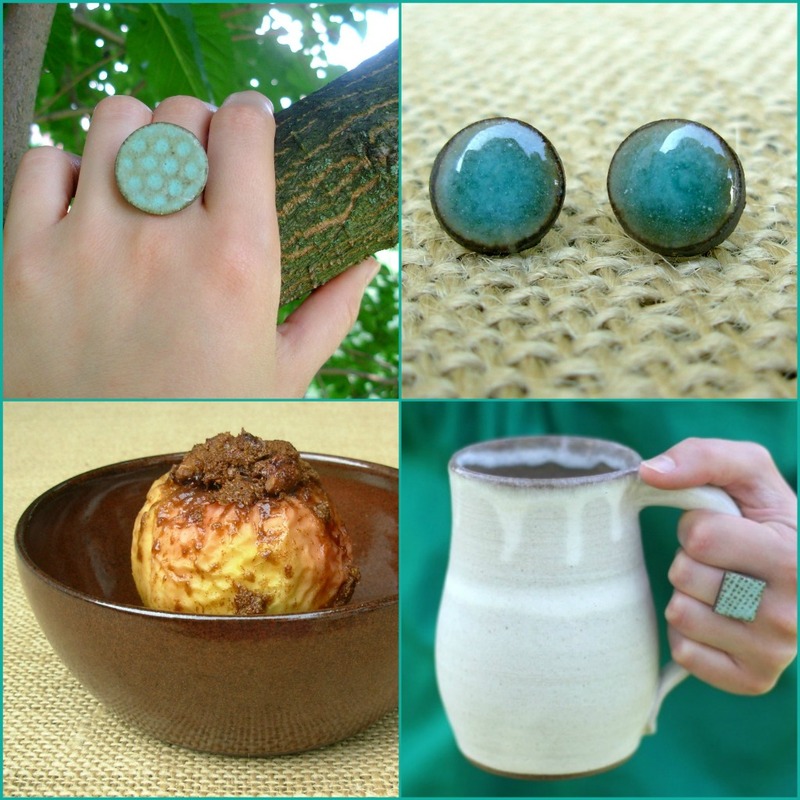 Natalie creates gorgeous & unique pottery pieces, from trinket dishes to jewelry to apple bakers. Speaking of, you should go check out her video on how to make baked apples and snag one of her apple bakers before Fall is over! Hi! I'm Natalie, a twenty-something single girl who has a heart for transforming dirty clay into something beautiful. I'm the owner/potter behind NS Pottery where I create durable, functional stoneware pottery and jewelry that I sell through my etsy shop as well as at art and craft shows in the northeast Ohio area. My blog is my place to share my life as an indie biz owner, as well as my faith in Jesus and other favorite things. (Stop by and say "hi!" I love making new friends) :) I'm truly living my dream, and for that, I am very thankful! 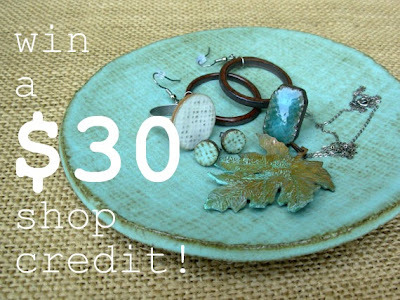 Today, Natalie is offering all of you a chance to win a $30 shop credit to NS Pottery. 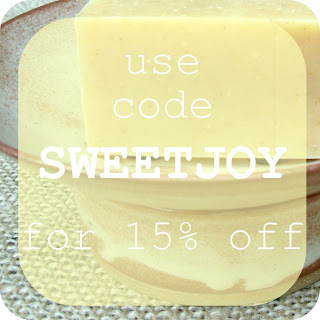 Not to mention, you can use the code SWEETJOY for 15% off your purchase! What a lovely shop! My favourite is the Soap Dish in Black. 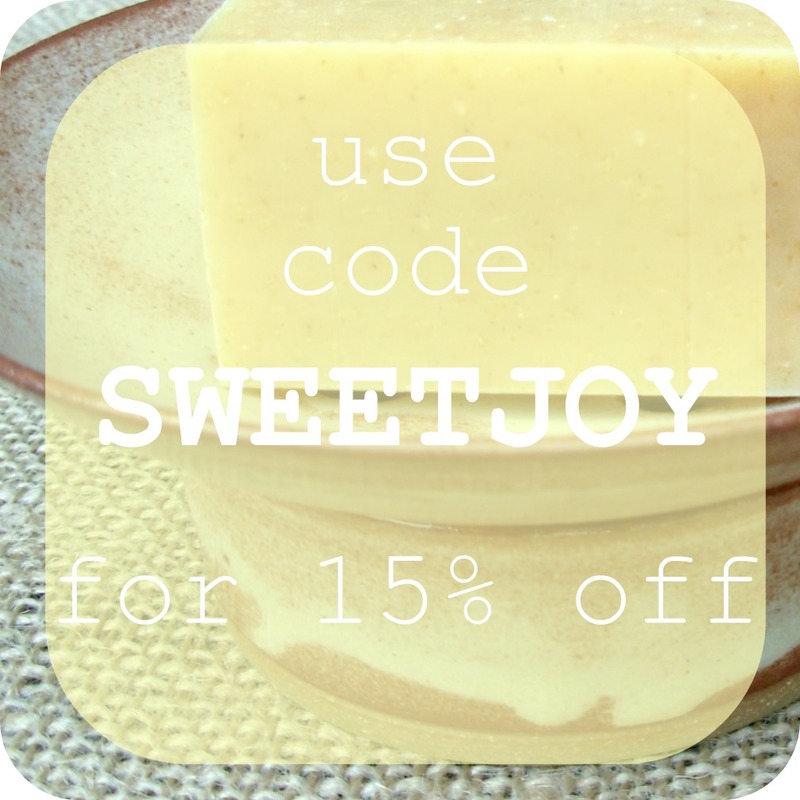 really loving the green patina soap dish! I'd go for the apple baker in espresso blue! How lovely! Thanks for introducing us :) I love the style of her soap dishes, sadly I don't have a sink that would accommodate one. I'm also taken with her coffee mugs and little pitchers! I like the teal trinket dish! I love the Pottery Pendant necklace in Purple Orchid! I love the Vintage Grape Dot ring. Oh my goodness. I've been eying the Green Patina Dot ring for ages! I just love the Sugar & Creamer in Rustic Red. I already follow you :-) does that count ? i am a sucker for that rustic red pitcher. I love everything in her shop but especially the cute rings. I follow yellow song bird via gfc! I just tweeted about the give away. :) Hope I win!!!!! The pottery earrings - purple orchid! I love the rustic red apple baker, as well as the purple orchid pendant necklace. If I won I would get a pair of the apple bakers though, such a good idea for a fall dessert! Following the Yellow Songbird via GFC! oh my goodness, I LOVE pottery. :) That patina soap dish is especially cute. What a wonderful shop! love the Pitcher in Rustic Red. So beautiful! I'm a follower of Yellow Songbird via GFC. i'm loving the pitcher and coffee mugs! i think the toadhouses would make cute soap dishes too, and who can resist the trinket plates? i'm tweeting it right now! The rustic cream pitcher is gorgeous! I really need one of those soap dishes! I tweeted about the giveaway and mentioned it on my blog. I love all of the coffee mugs and the apple bakers. What cool stuff! my favorite is the rustic cream teabowl! I just tweeted about the giveaway with a link back here! What a unique shop! I just love it. I would have to go with a mug or bowl or her trivet dish. So beautiful! I love the tea bowls...what cool stuff though!!! my fave item is the textured trinket dish! that would look super cute on my desk!